PITTSBURGH — While coal companies are tallying up their first-quarter profits, two more West Virginia families have an empty chair when they sit down for a meal. 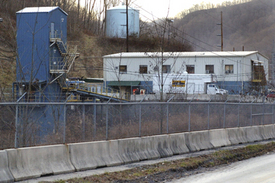 Robert Runyon, 48, died April 7 in a roof fall inside Jacob Mining Co.’s No.1 mine in Mingo County, W.Va. According to Caryn Gresham of the West Virginia Office of Miners’ Health and Safety, Runyon worked for an outside contractor, Southern West Virginia Resources, at the nonunion mine. Since Feb. 2, this mine has been cited 14 times by the federal Mine Safety and Health Administration (MSHA). Also on April 7, Jackie Lee Toler, 53, died at Mystic LLC Candice No. 2 mine in Boone County, W.Va. He died while working around an underground continuous miner, a coal extraction machine. Miners at Candice No. 2 are members of Local 9177, United Mine Workers of America. MSHA has only cited this mine once so far this year. UMWA President Cecil Roberts issued a statement extending the “hearts and prayers” of all union members to the surviving families. Federal, state and union investigations of the deaths are under way. Roberts offered the UMWA’s expertise to miners at the nonunion Jacob Mine. It is unusual for the U.S. attorney to announce a criminal investigation against a coal company. Miller said the extensive publicity surrounding mine disasters just two months ago convinced him to assure the community that an appropriate investigation is being conducted. Eighteen miners have died in West Virginia mines since January. Boone County, where Toler died, leads the state in coal production. Its 3,063 miners produced over 31 million tons of coal in 2004. Totals for 2005 have not yet been released. According to the West Virginia Coal Association, one pound of coal equals the energy in 189 gallons of gasoline. Delegates to the UMWA convention meeting in Las Vegas this week vowed to reinvigorate the fight for mine safety, both at the mines and at all levels of government. The union is gearing up for a battle with coal operators over health care when their contract expires on Dec. 31.